On Saturday November 3, as part of the St. John’s Storytelling festival Ragnhild A. Mørch will facilitate the workshop When the Body Speaks. 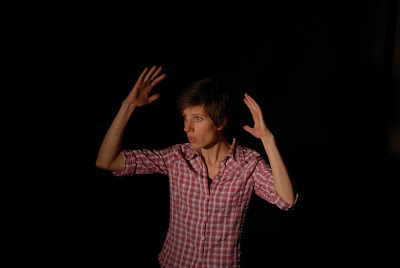 Her broad experience working in the arts throughout England, Norway and Germany will be evident during this workshop which focuses on the physical presence of the storyteller on stage. It will look at how the body communicates in its own right – with or without words. Ragnhild works with the whole arsenal the body has in store such as gestures, mimic, directions of movements, physical energy levels and the placement of the body on stage. The workshop combines exercises from physical theatre and storytelling and is open to experienced storytellers with a broad repertoire, including animal stories, repetitive tales and wonder tales. The workshop is hands on and fabulously physical so participants need loose clothing and shoes made for moving. And if you ever wondered... the course proves that every storyteller should own a bag of tennis balls and sign up for a lifelong membership in a fitness club! Visit www.storytellingstjohns.ca/wp/festival for information on other events happening during the festival. Ragnhild Mørch trained in directing, physical theatre, dramaturgy and storytelling, and has worked in live arts since 1996. Her projects include storytelling for BBC’s Music Live event in Hyde Park, direction of large scale outdoor promenade performances in Norway and England, collaboration with The Norwegian Broadcasting, drama teaching and play writing. She has been Artistic Director of a regional theatre centre with tasks as divert as financial management, staff management and marketing. Since 2005 she is a full time storyteller and focuses on storytelling both as performance art and as an educational tool for professional and personal development. She is Artistic Manager of the training course “Storytelling in Art and Education” at the Berlin University of Arts and has lectured at the University of Roehampton, London. Over a period of four years, she received funding to run long term research projects in schools in England to look into the effect of storytelling on children’s learning and personal development. She is invited to festivals all over Europe and her repertoire spans from fairytales to myths; historic events to urban legends; autobiographical stories to tall tales. Her studies in physical theatre and mime provide her with a unique physicality and precise timing and she tells her stories in Norwegian, German and/or English.